Melbourne. Cornucopia of NYE shindigs. Here's 25 - offering perfect atmospheres to see in 2016. There's a broad price-range; from free to 'splurge' (booking fees excluded). Venues are scattered across. 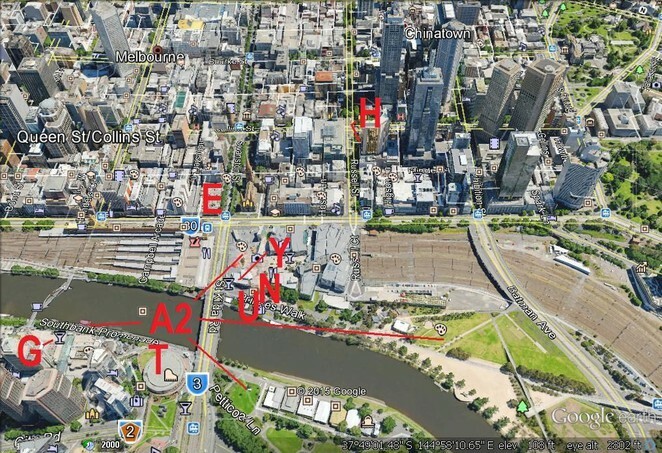 But generally towards Yarra River - nucleus of the NYE festivities. 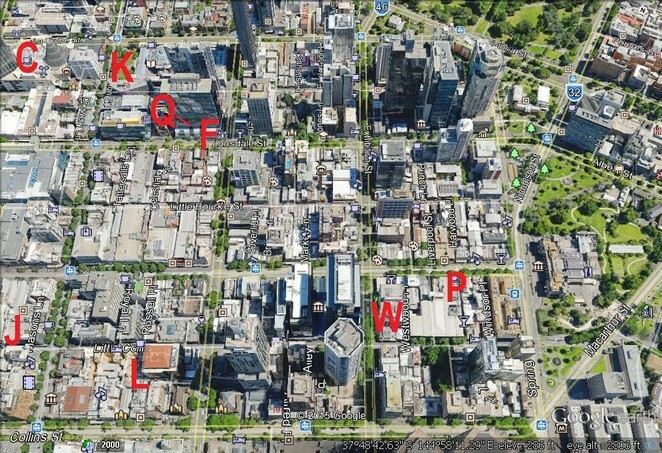 There's several outliers (located closer to La Trobe St). Perhaps worth weighing up: proximity vs loudness. i) The closer the event listing is to "A", the cheaper. Closer to "Z", less cheap. ii) Our tour begins at MCG. Paddles down to Crown Casino. Then U-turns - back towards the Royal Exhibition Building. Hence, you may opt to scroll down, select your favourite part of the city (using the images), then peruse what's on offer 'round there (by reading the list below it). iii) With links to venues, you can search, compare, plus make bookings. iv) The sample also provides a general sense of what's on offer 'round Melbourne. NOTE: Though rare, door-prices can fluctuate. Packages/deals, resized. Best to double-check before purchasing. So let's start at the MCG, where kid-friendly celebrations kick off nice and early (location marked on bird's eye image above). Time: 6:30pm - 9:30pm (concluding with fireworks). Short train ride back towards the CBD, we land in the heartland - prime territory for observing midnight fireworks (imo), Let's check out what's happening 'round here (again, listings below marked on image above). Where: Fed Square; fireworks launched from skyscrapers (I also marked ideal vantage points). Time: 8pm - midnight (concluding with fireworks). What: Comfortable, classic pub setting. 3 levels of entertainment/bars. Both bistro & a la carte. Where: Cnr Flinders & Swanston Street, Melbourne. What: Madhatter Party. Cocktail on arrival, plus canapés. 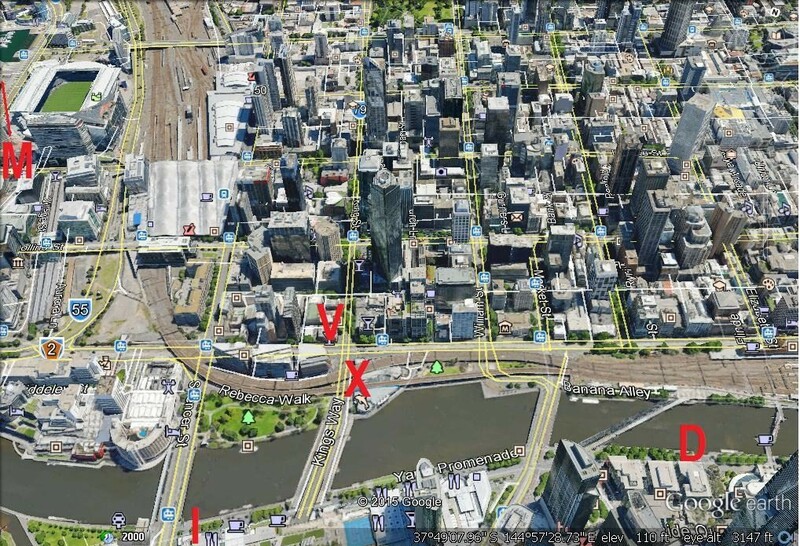 Where: 12-16/3 Southgate Ave, Southbank, Melbourne. What: Live entertainment. Give-aways. R&B and Top 40. Time: 10pm for drink on arrival & roaming mezze. (VIP: up to 11pm for that). N. PILGRIM BAR (Option 1: $85 per person for set menu. Option 2: $140 for cocktail party). What: Dinner packages / Drinks. Great view of fireworks. Where: 15-19 Federation Square, Melbourne. Time: Option 1: 6pm or 8:30pm, option 2: 8pm - 1am. T. APO NEW YEAR'S EVE 2015 CONCERT (Evening performance - B-Reserve: $100, A-Reserve: $120, Premium: $150 - with (cheaper) matinée deals available). What: Classical & operatic music, with conductor John Foreman, and MC Denis Walter. Where: Hamer Hall, Arts Centre, Melbourne. What: Beer garden with all-night entertainment, great view of fireworks. Where: Vaults 1-9, Federation Wharf, Melbourne (under Princes Bridge). What: Cocktail/spirit(s) inclusive. Live music. Canapés. Great view of fireworks. Where: Level 2, Transport Hotel, Federation Square, Melbourne. Sailing up the Yarra, we dock at Crown Casino. Docklands, also nearby. Let's take a squiz at the various offerings. D: LUDLOW BAR (Free entry between 5pm – 9pm. $10 cover charge from 9pm – Midnight. Packages listed below). What: Bar & Terrace with great views. DJ & entertainment till late. Where: 6 Riverside Quay, Southbank, Melbourne. 1. New Year's Eve Dining – Twilight Dinner: $65 per person. 2. New Year's Eve Dining – Midnight Dinner: $120 for inside, $160 for outside. 3. Exclusive VIP Cocktail Party on Bar Terrace: $180. I. LEVEL 3 AT CROWN NIGHTCLUB (Early Bird: $45 | 2nd Release: $50 | 3rd Release: $60 | NYE VIP: $60). What: Havana Brown, Joel Fletcher. Five rooms: house, RnB, EDM, bounce, & commercial. Where: Level 3 at Crown, Melbourne. Time: Kicks off at 10pm. M. PASSPORT TO BROOKLYN NIGHTCLUB (Entry is $76.39). What: Live entertainment - Great music - R&B on the Terrance. Great view of fireworks. Where: 161 Harbour Esplanade, Docklands, Melbourne. What: Food/drinks package, incl basic spirits. Watch fireworks from deck. Where: 508 Flinders St, Melbourne. To book: call 9629 1350 or email drink@watersidehotel.com.au. X. SEA LIFE, MELBOURNE AQUARIUM ($149 per person | Groups of 10/members: $140 per person). What: Performer. Sea creatures. Oysters/canapés/grazing dishes. Ice cream. Unlimited drinks. Where: King Street & Flinders St, Melbourne. Let's take our winnings and run (towards Queen Victoria Market). This takes us between Collins St and Lonsdale St, with Swanston St on the RHS. What: Sports-themed party with free billiards, plus prizes for best dressed sports fan. Where: 131 Queen Street, Melbourne. O. LITTLE RED POCKET BAR plus THE IRISH TIMES PUB (Early Bird: $110 | First Release: $135 | General: $150). What: 5 hrs of unlimited basic spirits, wine, sparkling and beer. Where: 422 Little Collins St, & 427 Little Collins St, Melbourne (respectively). R. CABINET BAR AND BALCONY (given it's business as usual, I placed this at the $100 mark). What: Dinner, supper, great balcony views. Where: 11 Rainbow Alley, Melbourne. S. CAMPARI HOUSE RESTAURANT (House package: $100 | Rooftop package: $190). What: "All That Glitters is Gold". DJ's, 4 hrs of beverages & canapé catering. Where: 23-25 Hardware Ln, Melbourne. Note: Both packages include: 4hr beverage package and canapé catering. Rooftop Package, also granting access to Rooftop Bar. Outbound, as we hot-air balloon towards Nicholson St. Drifting over Melbourne's upper CBD. What: Vibrant nightspot, with Latin music, roving performers & giveaways. Where: 211 La Trobe Street, Level 3, Melbourne. To purchase: These pre-sale tickets available from the bar. What: Large club with DJs pumping out electro/house. 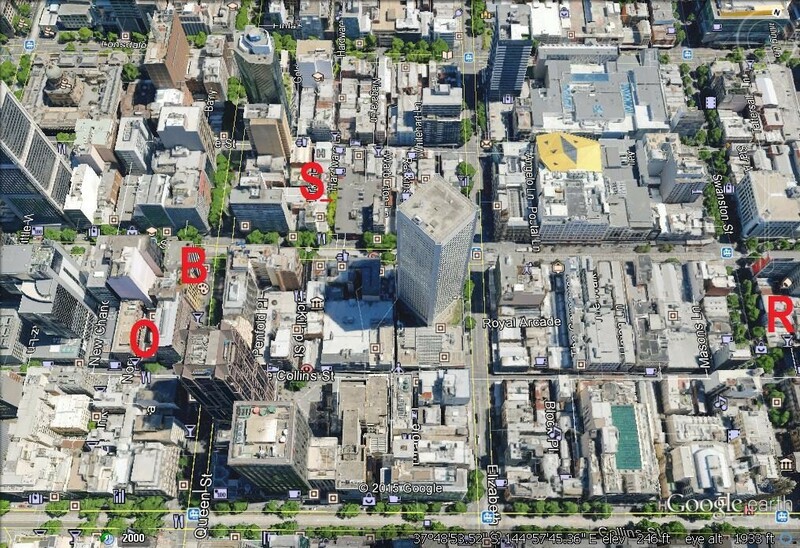 Where: 1/185 Lonsdale St, Melbourne. What: East-African inspired, with tribal beats. Drink on arrival, bar snacks, sparkling at 12am. Where: Level 1&2, 267 Little Collins St, Melbourne. What: Dinner (2 x complimentary drinks). Happy hour specials. Watch fireworks from balcony. Where: 249 Little Lonsdale St, Melbourne. L. THE LONG ROOM BAR AND RESTAURANT (Silver Ticket: $60 | Platinum Ticket starting at $180). What: "One Night in Paris". DJs, entertainment, cocktails, and flowing champagne. Where: Longroom, Georges Building, 162- 168 Collins St, Melbourne. What: Downstairs: Egyptian themed, with DJ | Rooftop: Drinks & canapés inclusive. Great view. Where: 23 Meyers Place, Melbourne. Q. THE ORCHID ROOM WINE BAR & KITCHEN (soon to be called: Meat, Fish, Wine) ($99). What: Dinner/drinks & canapés, festive music. 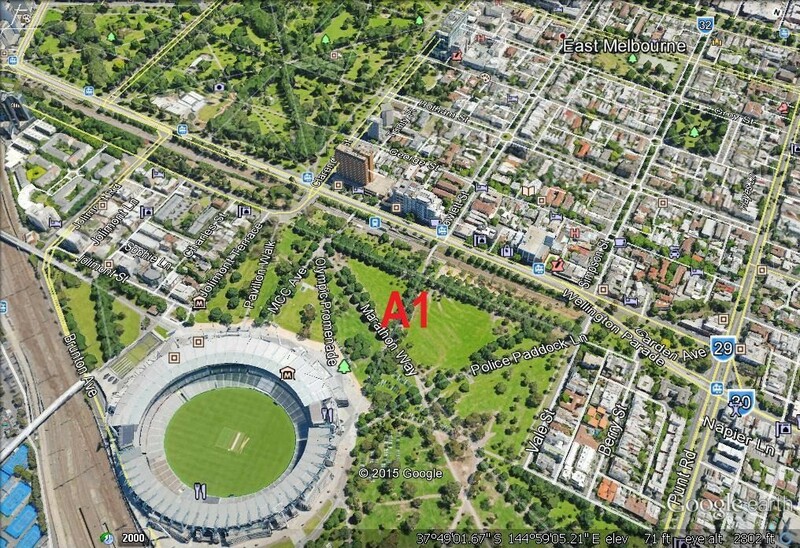 Where: 31 Artemis Ln, Melbourne. What: 80's dress up. Cocktail on arrival. Pizza, canapés. Live band/DJ's. Prizes. Rooftop view. Where: 120 Exhibition Street, Melbourne. Take care. And have a great, fantabulous night! HAPPY NEW YEAR!!! Very informative article. If I was in Melbourne this New Years Eve I would head to Federation Square. I love the way you've done this article.